Effective tumor debulking is a major factor associated with a favorable prognosis in patients with advanced ovarian cancer (AOC). However, FIGO staging fails to take full account of the extent of the disease in the peritoneum, making it difficult to plan appropriate surgical treatment. 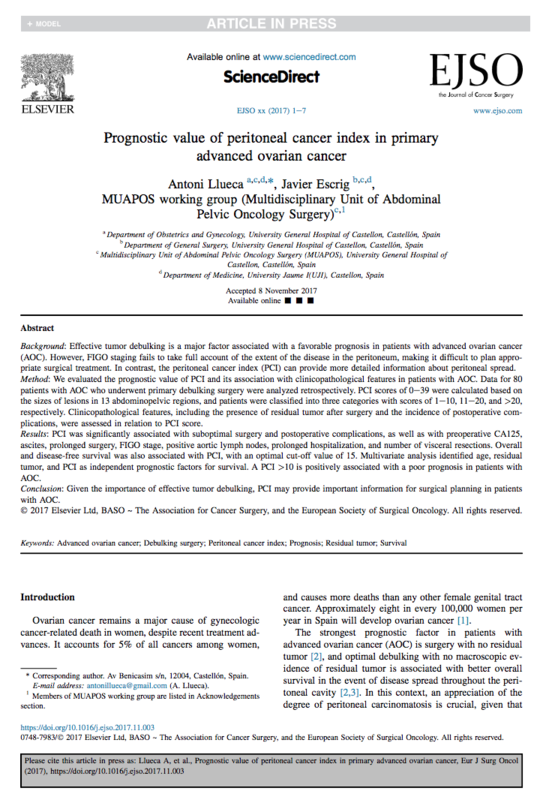 In contrast, the peritoneal cancer index (PCI) can provide more detailed information about peritoneal spread. We evaluated the prognostic value of PCI and its association with clinicopathological features in patients with AOC. Data for 80 patients with AOC who underwent primary debulking surgery were analyzed retrospectively. PCI scores of 0–39 were calculated based on the sizes of lesions in 13 abdominopelvic regions, and patients were classified into three categories with scores of 1–10, 11–20, and >20, respectively. Clinicopathological features, including the presence of residual tumor after surgery and the incidence of postoperative complications, were assessed in relation to PCI score.